Geeta Hippie clothes. Geeta Bohemian clothing. Artsy clothing for expressive women! Since 1972 Geeta of India has lead the way in creating classic gypsy hippie chick bohemian shabby chic styles for women and juniors. Handmade boutique styles at affordable prices. 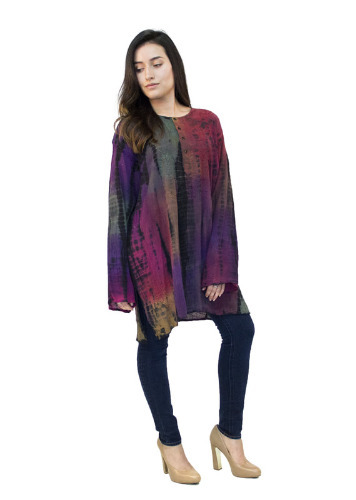 100% tie dye cotton peasant gypsy classic long sleeve Kurta blouse with beautiful embroidery throughout the neckline, front, and hem. Classic kurta cut. Bell sleeves, tone to tone embroidery. These kurtas come in a multicolor all over tie dye pattern on top of a solid color kurta and then over-dyed in black tie dye. The tie dye patterns are all multicolor and might not look exacly like the picture. As with all kurtas, the sizing might vary a bit on these. The measurements are an average. The perfect simple blouse that goes with everything. Check the measurements below. on 3/29/2017 Love this top! I had my eye on this top for a long time. It's perfect! Fits like it was made just for me. Colors are vibrant. Even got a hand-written note saying, "Hope you love it". Well, I LOVE IT!